Light: Pursuing a course of study. Asking good questions. Investing time in study and practice. Doing research. Making a habit of learning new things. Starting an investigation. Outlining what you need to know. Finding a mentor or teacher. Shadow: Pretending to knowledge or sophistication you do not possess. Cheating on an exam. Feigning interest as a way of gaining favor. Considering only the evidence that supports conclusions you’ve already drawn. Rejecting the wise counsel of experienced teachers. 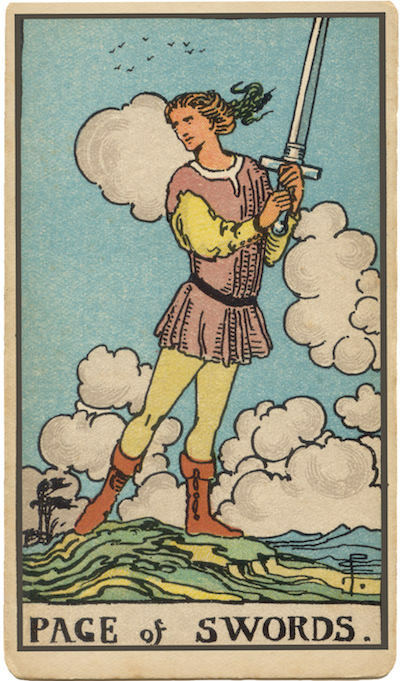 Personality: The Page of Swords can represent anyone who wants to (or needs to) learn (Page) more about intellectual pursuits, academic subjects, or good decision-making (Swords). Though eager to make a good impression, The Page may lack the experience or information needed to handle studies or assignments with responsibility and confidence. He or she may overcompensate for this with bluster, exaggerated credentials, or snap judgments. Story: The Main Character must humbly apply himself or herself to an apprenticeship or course of study. Relationships. Every relationship is an opportunity to learn about others and learn about yourself. Some relationships provide a lifetime of lessons; others run short of insights in a matter of weeks. Judge mistakes with kindness and affection; you’re both learning. Work. Get the training you need. Ask questions. Forget the stigma of “not looking capable”—smart and worthy superiors know who’s faking it. Be up front about what you need in order to move forward with confidence. Get clarification and point out contradiction. Spirituality. Spend time with whatever Scripture governs your path. Read books. Consult oracles. Ask a guide, priest, priestess, or other minister the questions that cloud your mind. Prayers for wisdom and patience can open doors to new insights and spiritual discoveries. Personal Growth. Keep your mind young by playing the role of the perpetual student. Enroll in a course. Visit a museum. See a movie you’d normally avoid. Ask someone who enjoys an art you find annoying to explain what he or she loves about it. Do all you can to shift perspective and see the world from new and exciting angles. Fortune Telling. This card represents a young man or woman with an airy, intellectual demeanor, likely born a Capricorn, Aquarius, or Pisces, who wants to learn something new from you or have a discussion with you. When? Between December 22nd through March 20th. Awkwardness and Silliness. Most RWS-inspired cards will feature a young swordsman in a romantic pose, indicating he’s more acquainted with the idea of battle than he is with its harsh realities. The Page of Swords wants to be an intellectual or scholar, but lacks the credentials or training to fill the role with much success at this time. The Windswept Background. In a nod to the airy nature of the suit of Swords, the background may be filled with puffy clouds and windswept landscapes. The Page, intrigued by every notion but lacking the experience to distinguish between fluff and hard information, is constantly blown in different directions. Sound familiar? The Desire to Know It All. Dedicating yourself to pure research—holding off on conclusions until all the information has been gathered, organized, and weighed – can become a means of putting off decision-making. The Marseilles Image. The Page of Swords looks surprised to find a Sword in his scabbard! (“Oh, so that’s what this thing’s for!”) Review the recent past. Has an off-hand decision, later overlooked or forgotten, contributed to your situation? If you’ve made mistakes, chalk them up to the learning process and move on. How comfortable are you with revealing your own ignorance? What are the marks of a good student? To what extent are you open to new information?